Back in 2003 Andy King published his first book: Speed Up Your Site. It was my first encounter with optimization of HTML and CSS, something that in recent years have been recognized as an important field by, among others, the YUI team. Now in 2008 Andy is back with a new book, but this time with a much broader scope. Website Optimization is not just about speeding up your site, it’s about optimizing it in several different areas. Everything from Search Engine Optimization and Creating the perfect USP to Optimizing page load times and measuring performance is covered. I’m surprised that even though the book covers so many areas it still manages to penetrate each topic pretty deep. Naturally not as deep as a book totally devoted to one of these topics, but still it manages to do more than merely scratch the surface. The book is organized in two parts. Part 1, Search Engine Marketing Optimization, is for you who wants to learn more about how to market your site and increase visibility and conversion rates. Part 2, Web Performance Optimization, is about how to improve page load times. I’m not that interested in SEO so I found those chapters pretty boring. But the chapters about how to improve conversion rates was more interesting. This topic is closely related to usability and how to design the user interface to encourage people to take action, while at the same time remove any barriers that stand between the user and the end goal. 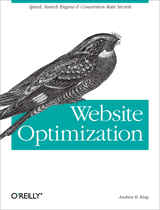 The second part of the book about optimizing web performance was really good. The chapters about how to optimize HTML and CSS contained several useful tips as well as references to different tools and resources. The chapter I’m particularly excited about is the one about how to optimize AJAX solutions. It presented me with new concepts and ideas that I found really useful. Since I myself is an advocate for developing with web standards, I’m pleased to see that Andy also is doing it in his recommendations and techniques. This is a big improvement from the last book where he recommended techniques that meant not adhering to current web standards. The broad scope of this book makes me want to recommend it for the not so specialized developer/marketer/designer that wants little bits of everything. But on the other hand I found the Web Performance Optimization part of the book to be good enough for any web developer who wants to learn how to increase performance of his site. The entire book is filled with statistics, results from real life tests and references to other resources. While it’s always good to backup your point with data, I sometimes felt that it got a bit tedious. All that statistic, especially in the first part of the book, made the reading a bit hard. All in all I still think that the book is so full of useful practical tips that it’s well worth the effort of reading it. There’s a companion site at www.websiteoptimization.com with extra material and articles. Thanks for your review of my book. I’m glad that you enjoyed the performance section of the book, people tend to lean towards the SEM or performance section of the book, based on their orientation (marketer vs. developer). I would disagree with you on the references and statistics. Although I certainly included a lot of them (we actually cut them down substantially in the editing process), I think that for SEO especially there is a distinct lack of research-based findings and a lot of conventional wisdom. I wanted to only include things that were proven to be true (at least true at the time of printing) by empirical tests or our experience with actual clients. Andy: You’re absolutely right! I’m definitely in the developer category. I also think you’re right about that it’s important to have real-world data to prove what works or whats not. I’m sure that if I would be into the whole SEO business, I would find it to be invaluable information. Overall I must say that I’m impressed by the amount of real tests performed throughout your book. It really gives substance to the points you’re making. Cool post about my review! Thanks! Website Optimization Secrets Book Review | Seo Optimization - Website Optimization - Google seo - What is seo ?